barbie life in the dreamhouse. . Wallpaper and background images in the Barbie films club. 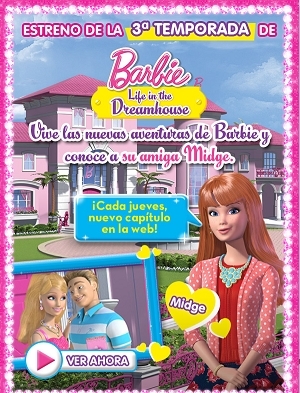 So Mattel decided to return Midge to life? Good too hear but I hope she won't get more attention that Teresa and Nikki. BTW What about Summer? They're still forgetting about her. I thought she would be Summer. Is it bad that whenever I hear about Midge, the first thing that comes to my mind is her somewhat rushed marriage to Alan (that's his name, right?) and the whole "pregnant Midge" doll controversy? Oh, yes! I remember this pregnant doll. My friend even bought it. We played together with her along time. Midge is pretty nice. It is good that they decided to bring her to business again. Still waiting for Summer. So what are we going to see in LitD? Adult midge with children or the teenage Midge before she grew up and Barbie decided to say a teenage. I never understood her story at all. How could she has two or three children if Barbie is still 17. Weird,right? So Midge IS back? Not going to lie, that makes me happy. She was my favourite out of Barbie's friends (and it might finally give me an excuse to sit down and watch this show). I always assumed that Midge just got on with her married life (husband, kids etc.) while Barbie just made more friends, but I suppose she could be brought back as a teenager. I'd actually quite like it if they acknowledged Alan, though.